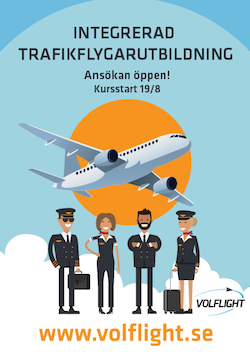 OSM Aviation Academy is now seeking Flight Instructors, FI(A) and IRI/CRI, MCCI to Västerås and Arendal, Norway. OSM Aviation Academy (OSMAA) looking for theory- and flight Instructors to our operations and flight training in Västerås and our new satellite at Arendal, Norway. We offer both part time and full time employment. Applications will be reviewed continuously as they are submitted. We are seeking instructors to our European bases in Västerås, Sweden and Arendal, Norway. We offer a professional organization and therefore place high demands on our personnel regarding responsibility, initiative and positive/creative thinking. There will be great opportunities for personal development through different responsibilities. We enjoy working with colleagues who are ambitious and willing to contribute to the further development of our organization, but above all you must feel a drive and passion towards teaching other people and value quality and safety in your work. The goal of our academy is to always provide our customers with the best education possible. Commitment, reliability and respect are words to live by at OSM Aviation Academy. We also accept applicants seeking theory instructor positions. You have a high-quality mindset and you are passionate about teaching and providing the best possible education for our students. Applicants speaking a Scandinavian language will be prioritized. English is a requirement. OSM Aviation Academy (previously Scandinavian Aviation Academy), is one of the largest flight schools in Europe and has delivered professional flight training for individuals and airlines alike since 1963. OSM Aviation Academy provides theory- and flight training in San Diego, USA, Arendal, Norge and in Västerås, Sweden with focus on efficient integrated flight training programs tailored to prepare our students for an airline career. OSMAA has a well-organized Safety Management System (SMS) with the goal of continuously improving our educational programs and flight safety.